It has frequently been stated that reproductive traits have low heritabilities, meaning little of the variation in reproductive traits is due to genetic differences. Due to this catchphrase, producers may not emphasize reproductive traits in their breeding decisions. Further, cows and heifers may sometimes receive a “Get Out of Jail, Free” card when their reproductive performance is lacking. Let us reconsider the amount of variation in reproductive traits due to genetics. First consider the Heifer Pregnancy EPD reported by the American Angus Association. They report a heritability of 14% for Heifer Pregnancy (https://www.angus.org/Nce/Heritabilities.aspx ). At first, this may seem like a very small percentage. But, to put it in further perspective, we can compare it to other traits that receive more attention. 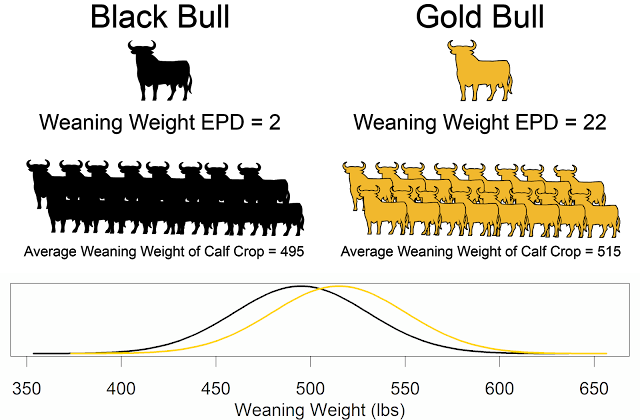 Weaning weight, the most consistently selected trait in Angus cattle from 1955 to 2007 (Decker et al., 2012), only has a heritability of 20%. The American Hereford Association reports a heritability of 27% for their Heifer Calving Rate EPD. Thus, there is sufficient genetic variation present to make sustained genetic progress for reproductive traits. 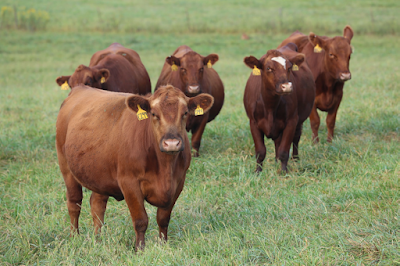 Due to the economic importance of reproductive traits, beef farmers and ranchers should consider putting more emphasis on reproduction when making selection decisions. Below, some of the tools available to accomplish this are discussed. Expected progeny differences (EPDs) and economic indexes are the preferred method of selection, as they are the most accurate and unbiased tools. Although they are newer than traditional growth EPDs, several breed associations publish fertility EPDs. These can be broadly characterized as heifer success or repeated success EPDs. Selecting for fertility EPDs will increase the reproductive performance of herds, assuming appropriate management practices are used. Probability of daughters becoming pregnant. Probability of daughters to calve as heifers. Probability of daughters becoming pregnant in a regular breeding season. Risk of daughter not achieving a calving interval of 425 days or less. Given that a daughter calved as a first-calf heifer, probability that daughter will calve at three years of age. Percent of daughters staying in the cowherd at 6 years of age. In some situations, such as selecting commercial replacement females, EPDs are not available. And, of course, all EPD predictions are based on sound phenotype records. Below, we discuss some of the traits that have been beneficial to measure in the Missouri Show-Me-Select Heifer Replacement Program. In the program, a prebreeding evaluation is required 4 to 6 weeks prior to breeding for all yearling-age heifers, and includes animal identification, weight, pelvic area measurement and reproductive tract score. We also require a pregnancy examination within 90 days from the start of the breeding season. One of the most common selection practices to improve herd fertility is to simply cull open cows. For herds looking to improve reproductive performance, this will continue to be an effective strategy. Reproductive tract scores are used to access the puberty status of heifers for selection decisions and timing of estrous synchronization. Based on rectally examining the uterus and ovaries, heifers are given a 1 to 5 score corresponding to prepubertal/infantile tract, prebubertal/greater than 30 days to puberty, peripubertal/less than 30 days to puberty, pubertal, pubertal/has already ovulated. Pelvic measurements can be used successfully to identify abnormally small or abnormally shaped pelvises. These situations, left unidentified, often are associated with extreme calving difficulties. Because pelvic growth is strongly influenced by puberty, pelvic area may also be an indicator of puberty status. An initial pregnancy examination should be performed within 90 days from the start of the breeding season. Individual animal identification, pregnancy status and fetal age (in days) should be recorded. Herds utilizing artificial insemination should report breeding dates. Pregnancy determination at this point relative to the start of the breeding period enables the veterinarian to more accurately determine fetal age and success of the heifer’s first breeding period. Opportunities exist to research the genetics and genomics of heifer fertility. Reproductive tract scores may be an important indicator trait to more reliably predict heifer pregnancy or heifer calving rate EPDs. A Beef Improvement Federation committee has also been formed to improve the recording and reporting of female reproductive data. Selecting for More Fertile Females - Dr. Jared Decker, University of Missouri from Iowa Beef Center on Vimeo. *Post updated on 10 November 2015 to reflect new definition of Sustained Cow Fertility.